Back in 2016, at the Best Practices for Chemicals conference in Houston, Texas we met Huntsman Chemicals. They attended a few of our speaking sessions and since then Reveal has been in multiple discussions and working sessions on how to maximize their current SAP System investment, while optimizing their Supply Chain at the same time. The whole process began with Huntsman taking a hard, honest look at their Business Maturity® across their end-to-end Supply Chain and evaluating their ability to scale for growth. In essence, asking the question “Is it the software, or is it me?”. To help answer this question they engaged us to perform an oVo® Wellness Assessment. The Wellness Assessment uncovers Supply Chain inefficiencies and opportunities to realize tangible value by utilization of their SAP system. The assessment uses objective facts and data (SAP standard reports) presented back in a story line that helps clients understand the bigger picture and opportunities they have to improve – in essence a Supply Chain selfie using SAP system data. What Does Reveal Typically See When We Take a Selfie of a Client’s Supply Chain? Supply Chain centric companies are driven by two main drivers: Customer Service levels, which impacts Revenue and Operational Cost, which impacts Profitability. 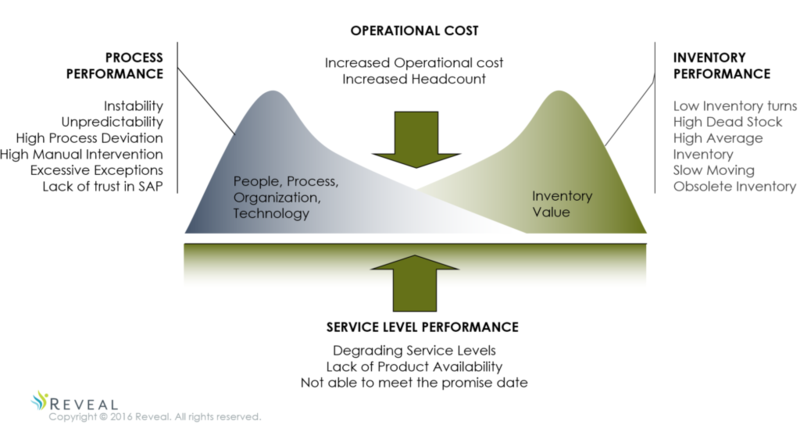 At a high-level, the two main areas that typically effect operational costs and impact service levels is the performance of processes and inventory. As the diagram below illustrates, when focusing on inventory performance, the areas that require attention are; too much inventory of the wrong materials (under performing working capital), too little inventory (stock-outs) of the right materials, high dead stock (excess/buffer) inventory and low turns. On the process side, this typically encompasses the organizational structure, people and technology (SAP); the symptoms you see here relate to instability, unpredictability in the process and a tremendous number of manual work-arounds mainly due to skepticism in the system’s accuracy. The Wellness Assessment provided Huntsman with information directly from their system that highlighted these issues and many of their root causes. In addition to these findings, the Assessment delivered a prioritized roadmap and business case to help them develop a path forward to improve service levels and reduce operational costs with tangible outcomes. Armed with a clear understanding of their challenges and a plan to address these challenges Huntsman has embarked on a Transformation initiative to address these performance drivers with high expectations to increase Service Levels and Reduce Operational Costs (or increase efficiency). Now, two years later after we first met at the Best Practices’ for Chemicals conference, Huntsman will be presenting at the 2018 event in Austin, TX about their ongoing VALUE optimization® ~ oVo® journey to Optimize their Supply Chain. The lessons learned, the results of the effort and the road forward.